The trainers and leaders of SDONA bring a collective wealth of over 75 years experiences to our efforts to develop and nurture a sound education and skill building program for K9 SAR teams throughout North America. Bill Dotson began dog training in 1971 when he and his wife became interested in AKC obedience. He later transitioned to Schutzhund (German protection dog sport) in 1975 and then founded and was training director of the California Rescue Dog Association in 1977. He earned "Mission Ready" status with the Swiss Disaster Dog Association after training in Switzerland. From 1978 to 1980, he assisted the Davis California police department as a volunteer police dog team. After moving to Virginia, Bill joined Dogs East and was an operational member from 1982 to 1997. During his long canine career, Bill has responded to a very long list of national and international disasters. Because of his experience, he was tasked with assisting FEMA in the development of their criteria for FEMA Disaster Task Force dog teams. He also worked with Virginia Task Force 2 (VA-TF2) in the development of their K9 teams. Bill is a regular speaker and seminar leader on Search and Rescue, Disaster and Cadaver search dogs. He has acted as an advisor to numerous search and rescue teams around the world. He is also the founder and President of Applied K9 Technologies. 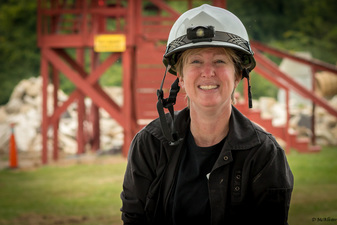 Jackie started her career in Search and Rescue with Kentucky Search and Rescue Dogs in 1992. She has trained two dogs in wilderness & HRD and two dogs in live-find disaster to the operational level. The Falmouth, KY, flood in 1997 was her first disaster. Working that disaster made her realize the need to increase and standardize the education and training for SAR K9 teams. She transitioned exclusively to disaster dog work in 2005, and is a member of a task force in Indiana. She is currently working with her fourth SAR dog, Quinn, a 5-year-old Belgian Malinois. She is a disaster dog evaluator and has been deployed to several disasters including searching for survivors after Hurricane Katrina. For her day job, she is a LVT and is the Surgical Manager at the University of Louisville large animal facility. Kathy has been volunteering as a Helper (Victim) with the K9 Operations Team with the McLean County Emergency Management Agency in Illinois since 2012. She has been heading out into the woods “getting lost and disorientated” to set up realistic training scenarios for many different SAR K9’s and their handlers to better equip them for an actual mission. Kathy has been training dogs for the past 15 years and specializes in puppy and rescue/shelter dog obedience training. She loves to see the working bond between the trainer and K9 strengthen as new skills are learned together as a team. Kathy and her nine-year-old Golden Retriever named Harley have been a certified Therapy Dog Team for the past 5 years visiting area nursing homes, college campuses and libraries. Kathy is also the CFO of a manufacturing rep company that has offices in Chicago, Peoria and Bloomington Illinois. ​Cindy started training dogs and their owners in 1977 on an in-home basis, specializing in obedience and behavior modification. She has been a SAR K9 instructor since 2000 when she joined the K9 section of﻿ Yavapai County Sheriff's Response Team ﻿in Prescott, AZ. Since 2009 Cindy has been on Coconino County Sheriff's SAR K9 Team. Cindy has been deployed by the National Park Service at the Grand Canyon numerous times. Her HRD K9s have worked cold case missions for the AZ Sheriff's Office, private investigators and AZ Police departments. In an effort to provide higher quality instruction opportunities to AZ and the surrounding states, she founded the AZSAR K9CON in 2010 as a way to bring nationally recognized K9 SAR instructors together with K9 handlers on an annual basis. Initiated into dog training as a Helper for Police Dogs back in the 1990s, Lynn was determined to find a better way to train dogs than through the commonly accepted compulsive methods. Over the years, she has worked with various SAR teams to learn what techniques worked best. She eventually found her home with IDK9, a nonprofit SAR K9 training group that was the predecessor to SDONA. Lynn has certified dogs through the North American Police Work Dog Association (NAPWDA) in tracking, evidence search, and area search. She is training her current K9, Gator, in IPO-R standards for Disaster Response. Lynn coordinates the training events for SDONA--finding venues, managing personnel, locating dog-friendly hotels, etc. During the events, she assists the Lead Instructors as a victim, hiding for the dogs (sometimes for hours) in dark, cramped spaces that would make even squirrels claustrophobic. Joan Brehm began training SAR dogs in 1998 while living in Missoula, MT. She has been a volunteer K9 handler with the Missoula County Sheriff's Office, Weber County Sheriff (UT), Illinois Search Dogs, and is currently the Sergeant for the K9 Operations Team with the McLean County Emergency Management Agency in Illinois. She has trained and certified three SAR K9s (a Redbone /Lab mix, a Redbone Coonhound, and a Golden Retriever), and is currently working to train her fourth, a Golden Retriever puppy named Jessie. Her K9 partners have certified through the North American Police Work Dog Association, the International Police Work Dog Association, and the National Narcotics Detector Dog Association in a variety of disciplines, including avalanche, wilderness area search, disaster search, land and water human remains detection, and trailing. She has participated in hundreds of missions over the years with her K9s across the country and has also served on several international missions. Matthew Noar began training dogs in 1999 as decoy/handler in a local Schutzhund club, and as an instructor for the Woodford County, Illinois 4H dog obedience program. 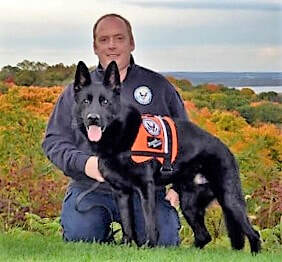 Since then he has volunteered with Illinois Search Dogs as a decoy/flanker and is currently the Corporal for the K-9 Operations Team with the McLean County Emergency Management Agency in Illinois. He began training his first K9 partner Küster (German Shepherd Dog) in 2011 and they have certified in tracking and trailing with the North American Police Working Dog (NAPWDA) and wilderness area search with the International Police Work Dog Association (IPWDA). Matthew currently sits on the Board of Directors for the Illinois Search and Rescue Council (ISARC) and has been active with Search Dog Organization of North America (SDONA) as a helper/victim, hiding for dogs, since 2015.